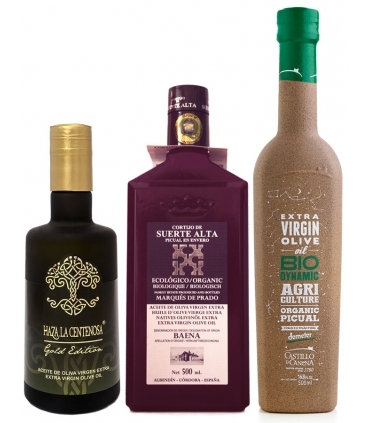 Selection of 4 bottles, 3 producers, 4 olive oils from ecological agriculture. 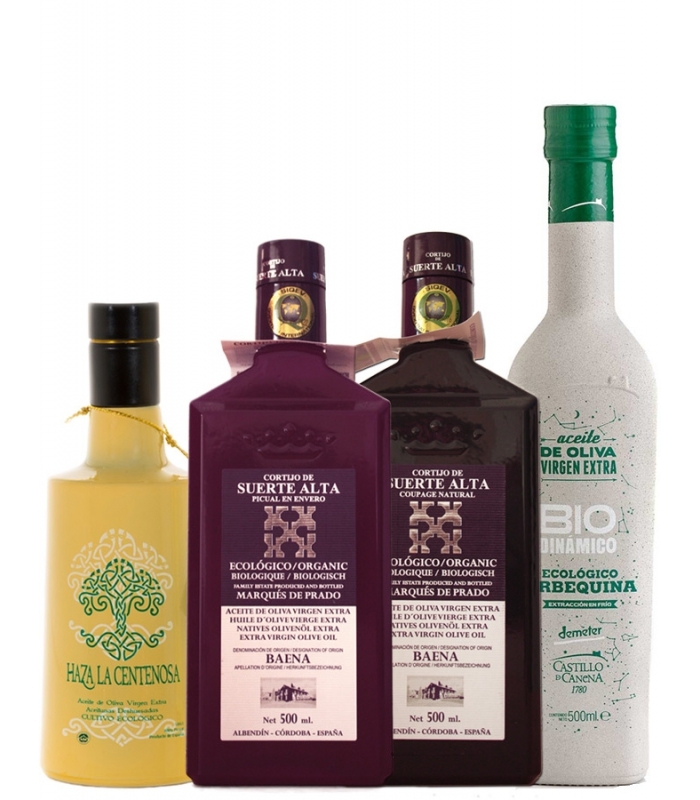 “Coupage” (blend) oil (picudo, hojiblanca, picual), or monovarietal (picual or Arbequina). 100% Picual variety. 0.5 litre glass bottle. From an olive grove in the Sierra Mágina Natural Park (PDO Sierra Mágina, Jaén). 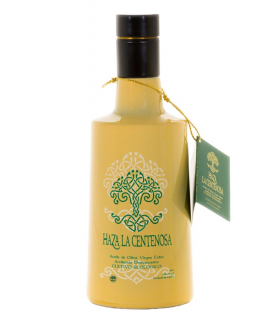 A sweet olive oil that retains the characteristic spiciness and sharpness of this local olive variety. From a mixture of different varieties of olives (Picudo, Picual and Hojiblanca). 0.5 litre glass bottle. 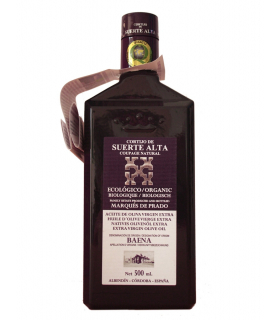 This oil contains all the nuances to be found in the 3 varieties of olive from the Suerte Alta certified organic olive grove. 100% Picual variety. 0.5 litre glass bottle. At Suerte Alta, we try to capture the intense flavour of this olive variety and to enjoy its benefits (high content in natural antioxidants). 100% Arbequina variety. 0.5 litre glass bottle. Limited production that has already won many awards. 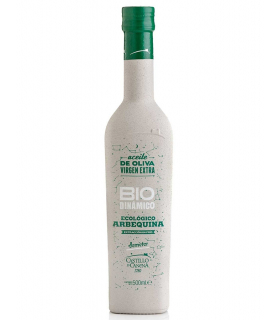 It is an oil produced with total respect for nature and soil, the olives are cultivated organically and biodynamically. In search of purity and quality. 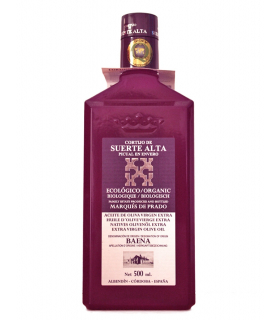 Extra virgin olive oil of the variety Picual, produced by Cortijo de Suerte Alta. 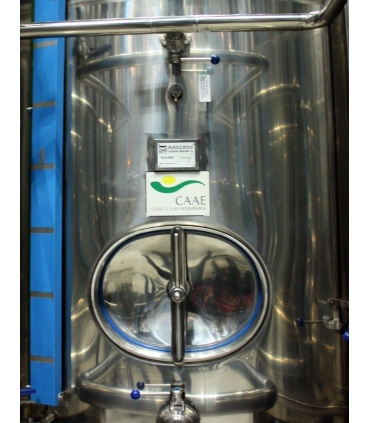 Extra virgin olive oil of the Arbequina variety, Biodynamic, produced by Castillo de Canena and benefiting from the Demeter label. 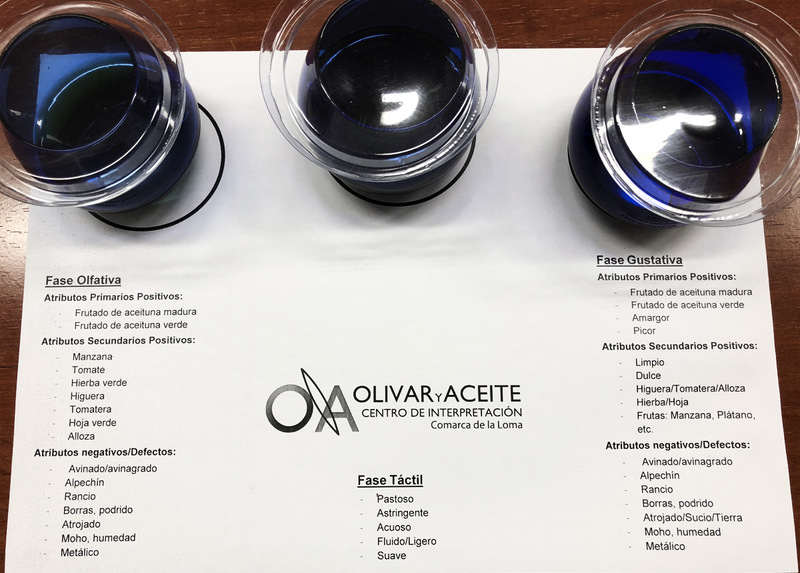 With this kit you will be able to pass to the stage of the good amateur informed by tasting the oils according to the rules in force at the Interpretation Center "Olivar y Aceite" in Úbeda, province of Jaén.